Illus. in full color. 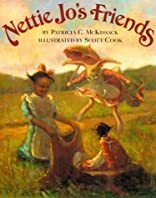 While searching for a sewing needle to make her doll a new dress, "Nettie Jo helps Miz Rabbit unflop her ears, Fox get the sun out of his eyes, and Panther stop his sneezing. The trio turns up on her doorstep, with a needle as a thank-you gift. 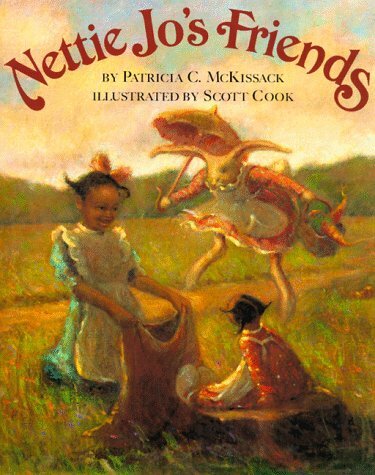 McKissack sets her story in the rural South at the turn of the century and offers a feisty black heroine whose ordinary concerns are caressed by fantasy. Cook's oil paintings are suffused with a golden glow...as soft as a kiss, yet filled wtih energy. A warm, witty wedding of text and art." --(starred) Booklist.